Imagine this: You’ve woken up extra early to go for a run on a beautiful Thursday morning. It’s summer, after all, so you want to take advantage of being outdoors as much as possible. You run along the lake as the sun rises over the water, with your favorite music clearing your mind and waking your senses. After this short but successful run, you return to a quiet house with everyone still asleep; it’s peaceful. After a refreshing shower, you brew a cup of coffee and begin to prepare your breakfast, flipping on the news for a little background entertainment. For breakfast, you need something hearty to restore your energy after your run and prepare you for the day, but you also need it to be simple and hassle-free, not to mention delicious. Enter: The Perfect Oatmeal. Not only tasty, this surprisingly filling dish will stave off hunger pains ’til lunch. 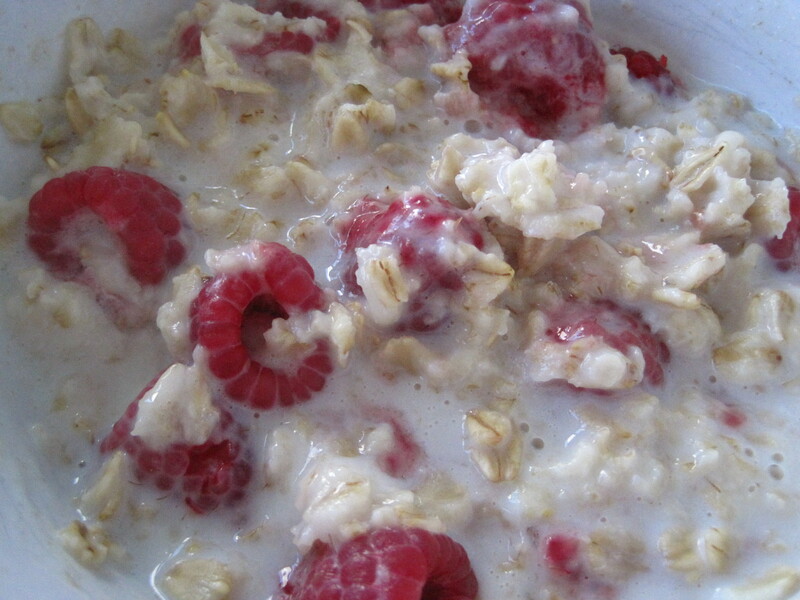 It’s steel-cut oats cooked in a cup of milk, topped with raspberries and sliced almonds. The oats have the post-workout carbs your body needs, while loaded with good-for-you fiber. The creaminess of the milk adds decadence to an otherwise bland grain, and gives your muscles the protein they need to rebuild. The raspberries add tartness, sweetness, and juiciness, and the almonds add flavor and texture. And there you have it: The Perfect Oatmeal for the perfect breakfast on the perfect weekday morning. Pour the oats and milk in a microwave safe bowl. Microwave on high for 2 1/2 minutes. Once it’s done, add the raspberries and almonds then stir. Let it sit for just a minute to cool, and enjoy! It’s important to use the regular, non-instant steel-cut oats. Until recently, I didn’t know how much of a difference they made. I find that the instant kind is mushy and bland. These babies have the texture and flavor that the instant oats are missing. Add the few other ingredients I’ve listed, and you have a 5 minute, heavenly delicious, super healthy breakfast. It’s my latest easy go-to during the week when I don’t have time to make my favorite omlette or pancakes, and it’s great alternative to my overnight oatmeal. Starbucks has nothin’ on this one. My earliest cooking memories are sitting on the kitchen counter and cracking eggs while “helping” my dad make one of his Bisquick specialties – I couldn’t have been more than 2 or 3 years old. Cooking with Dad was a weekend tradition in my family, and every Saturday and Sunday we made something off the back of the Bisquick box, whether it be pancakes, waffles, or coffee cake. Needless to say, I’ve come a long way since adding egg shells to pancake batter, but cooking off the back of the Bisquick box remains a weekend tradition (I’m partial to Bisquick because you have to add milk, all those “just add water” pancake mixes aren’t nearly as good). Here’s my step-by-step on how to make the perfect pancake so you can start your own weekend family tradition. Nothing beats pancakes with fresh berries on a lazy Sunday morning. Preheat your pan one tick over medium on your stove so it’s just slightly medium-high. Spray your pan with cooking spray (you’ll only do this for the first batch of pancakes, don’t keep spraying every time you add batter to the pan). I always stir my pancake batter in a larger measuring cup. This helps save dishes, and I love how my measuring cup has a spout for easy pouring. 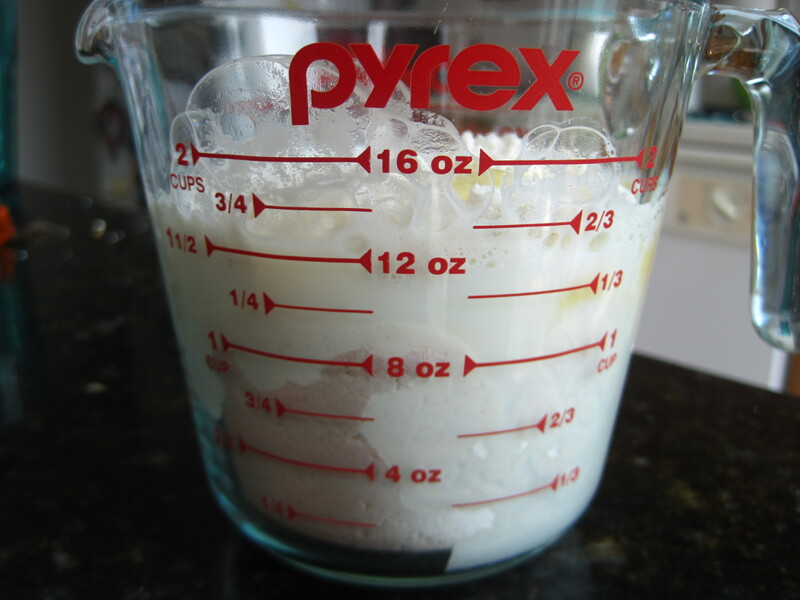 I pour my ingredients right up to the measurement lines. 1 cup of Bisquick goes in first, then I fill the milk up to the 1 2/3 mark, and then just add the egg and vanilla. Easy as that. Simply combine all your ingredients. Your batter will be slightly runny. 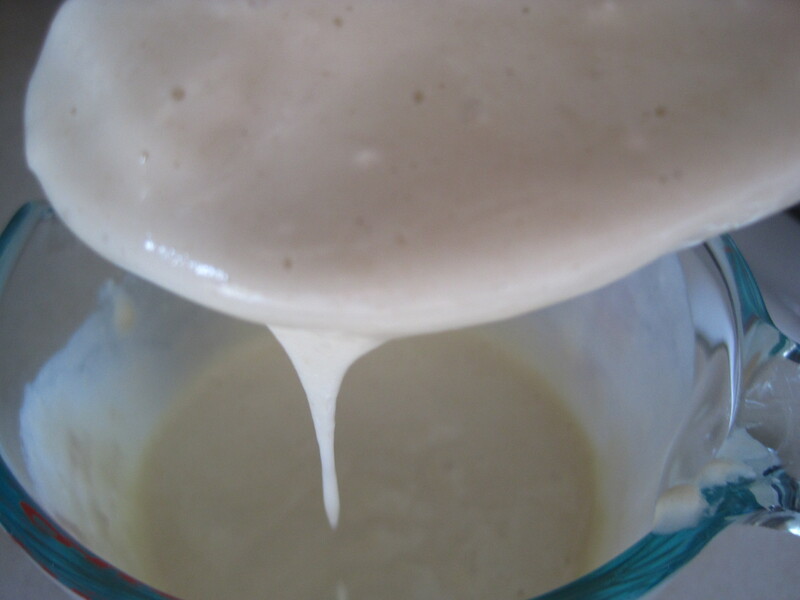 The runnier the batter is, the thinner your pancake will be. When the batter drizzles off your spoon, it’s perfect. It should be about the same consistency as cake batter (hence, pan-cakes). 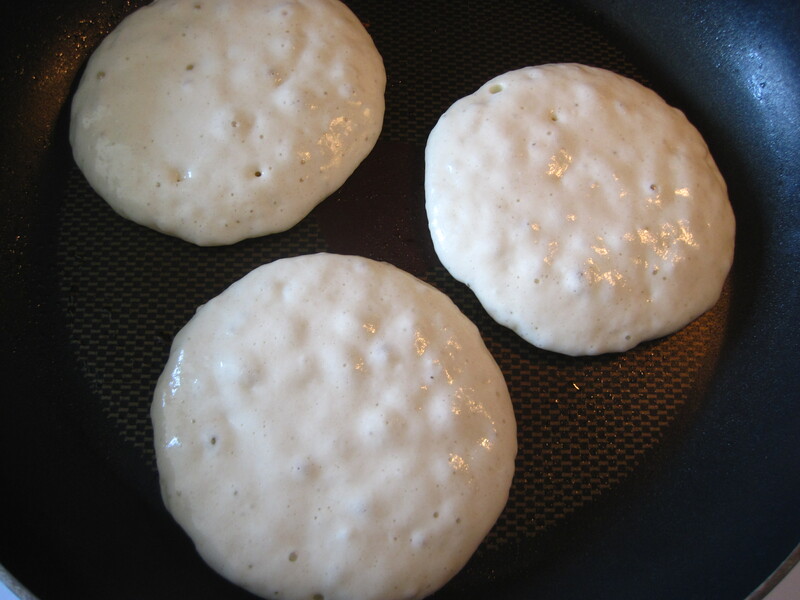 Pour just a few tablespoons worth of batter into your pan so that it takes up about 1/3 of your pan (you’ll want to fit 3 or 4 pancakes in there). I’m careful to not make my pancakes too big, because the bigger they are the harder they are to successfully flip. Watch your pancakes, and after a few minutes you’ll see bubbles start to come up around the edges and throughout the pancake. All those beautiful bubbles let me know these babies are ready to flip. Use a large spatula to flip your pancakes, making sure to get completely under the pancake before you flip it so that it doesn’t fold on you (don’t worry if it does, it’ll still taste good!). 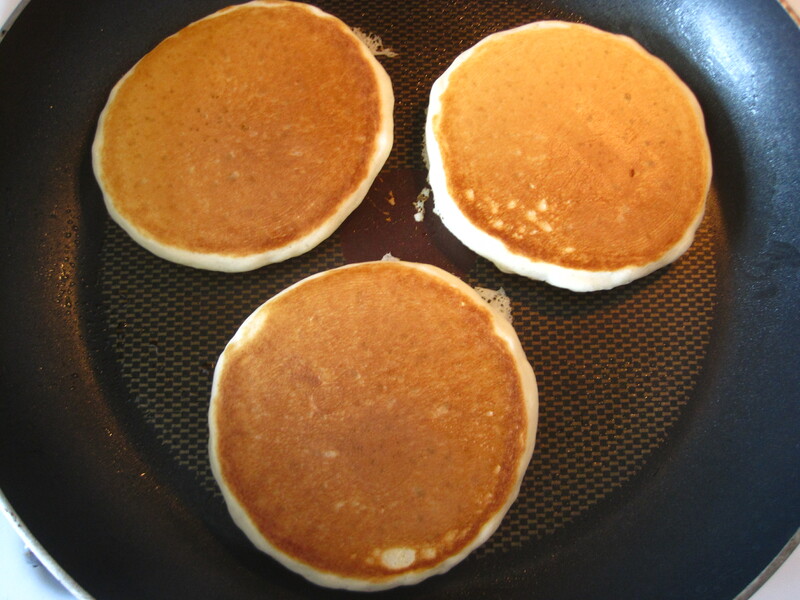 After your pancakes are flipped, let them sit for just a couple minutes to cook the other side. 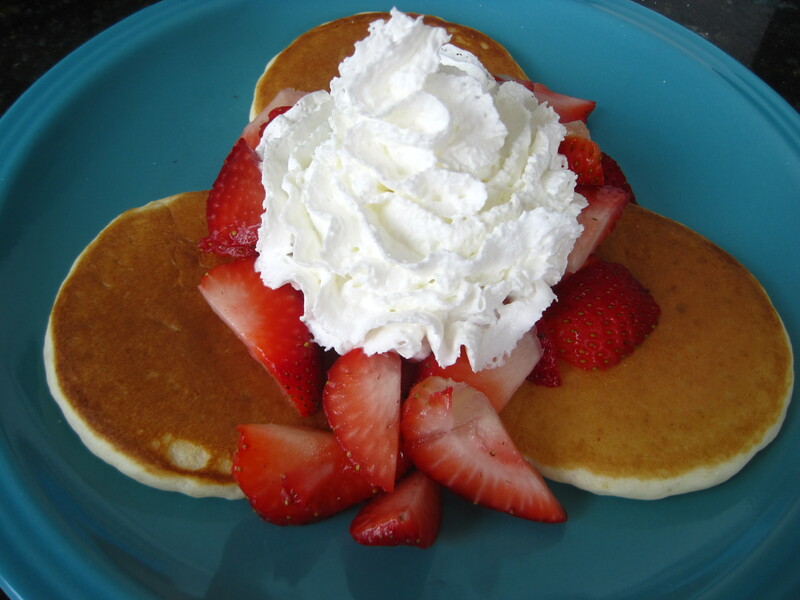 Serve with sliced strawberries and whipped cream, syrup, or (Clinton’s favorite) Nutella. In less than 20 minutes with all kitchen staples, you have a beautiful, fun Sunday breakfast. Enjoy! Greek yogurt is my one of my favorite snacks in the whole world. It’s loaded with protein (about 22g per cup) which makes it very filling, and at the same time it’s relatively low in calories and a delicious vehicle for fresh berries. It’s a little tart, a little sweet, and it fills my craving for creamy goodness. This is the ideal post-workout snack because it’s so high in protein. Fitness and nutrition experts recommend eating a protein-heavy snack within the “golden hour” after a strenuous workout to replenish your energy stores and rebuild your hurting muscles, and I’ve found that Greek yogurt is perfect answer. Not only that, but Greek yogurt is also great for breakfast or even right after I get home from work (because it’s so filling, it curbs my ravenous desire for an entire bag of chips). There’s a reason it’s in my kitchen staples! My favorite simple, super nutritious go-to snack. Step 1: Put yogurt in bowl. 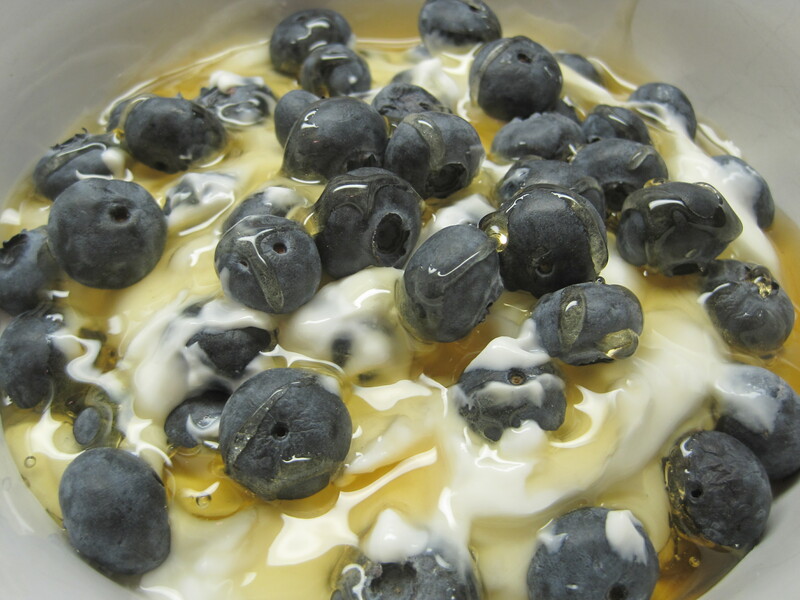 Step 2: Put one or two handfuls of your favorite fresh berries on top of yogurt. Step 3: Drizzle with honey (or scoop on no-calorie sweetener). It’s that easy! And so delicious. Total time to assemble: About 2 minutes. Total calories: Around 200 (depending on berries and honey vs. Stevia). You can’t beat this tasty treat.